My partner went to the mainland for two weeks to settle and close out some old accounts. She will be coming back in a couple of days. I was trying to think of something special to do at the airport when she gets off the plane. For me, this last week has been an awesome week, both at work and elsewhere. We had training in sexual harassment in which I was asked to explain gender – all the women from my department surrounded me in that training and supported me. For the first time I dressed feminine at work and was received well. The ‘alpha’ male was out on vacation when we had a number of critical failures at the observatory – another woman and myself were able to fix these and be back on sky each night. When he came back to work he commented (in a very nice way) that the “two wahine’s” had everything under control (wahine = woman in Hawaiian). That was given as a compliment, he was proud of us. I met with my therapist and discussed these events. We both agree that perhaps I will move up my RLE (real life experience – living as a woman full time) from Nov. to now, given that my confidence and comfort are getting to a point where I feel I could handle that. With the help of two of the women at work we addressed the remaining issues (like restroom usage) with all the other women in the building. My boss said he will give an all hands party whenever I would like in order to officially announce/celebrate my coming out. So, what you may ask, does all this have to do with my partner coming home …..
Before she left, we both looked at this gorgeous long black dress, halter top but with a plunging neckline and it has silhouetted flowers stitched in down one side in white. Well of course I bought it after she left ! For my birthday she had given me a silver jeweled key on a necklace which goes beautifully with this dress. I also bought an open sweater to cover my shoulders and upper arms plus small hoop silver earrings to go with the necklace. I wore this to my therapist appointment to get her opinion on the feasibility of meeting my partner at the airport – as in walking through a crowded airport and waiting for her to de-plane! So we talked about my level of comfort and also backup plans (like having something more androgynous in the car and change if I feel like it). But she did not see any reason after discussing this with me why I shouldn’t go forward – in fact she encouraged me. Not only that, but she called up a friend of hers that will do my makeup and hair on that day! For me, this will be ‘huge’. Already, this was my first time purchasing a dress and sweater by myself, first pair of earrings and the biggest first of all – first time ever going out in public (an airport – geeeesh) in a dress – a very beautiful dress. Not only that, we are going out to eat at a fancy restaurant after. For two weeks now, I have been debating whether or not to do this. But at the same time preparing and getting everything ready. Given the events of this week, I feel another turning point has been reached. My comfort at work, at being able to be the ‘authentic’ me – communicating from my true being and having others respond to me – as a woman – has brought me around full circle to the ‘why’ I am transitioning: to be authentic to my being, to have my outward and inward selves aligned/congruent and to be comfortable in my existence. I can not post this until after my partner arrives because she reads these posts! That means the last part of this will be written and posted after she arrives and you (and I) will see how this went…. Nothing is ever simple – her plane was canceled and she was rescheduled for the next day. I had to quickly reschedule all my appointments (some with people that were very busy and had fit me in to begin with). Then the next day, her plane was delayed and she missed the 2nd flight to Honolulu, pushing out her arrival time from 5 pm until almost 9 at night. Two of the women at work plus my therapist and the woman that hosts our transsexual’s support group gave me amazing support. One woman at work wrote: “whenever I do something over the top – I feel it, I own it, I be it – because we ‘can’ ” ! That was the best advice and the perfect advice I needed. One of them paid for me to have that makeover (as it turns out, two of them knew this person). I went in at 3 pm and had a great time with a wonderful woman that did an awesome makeover. Not only colored and styled my hair, but waxed my eyebrows, eye makeup and facial and lips. This gave me the confidence to go through with the rest. Well, the hardest part was coming home and waiting for the time to go to the airport. My partner called to say she had landed in Honolulu and was just waiting for her third flight – to Maui. Still, it seemed like ages before I could leave for the airport. As I was traveling down the highway, about 15 mins before she was to land I saw a plane coming from the right direction. I watched it land as I drove down the mountain knowing it was her plane, but getting worried that now I might be late getting there! Turns out her plane was early. I parked and was just getting the leis out of their boxes when she called me from inside the airport – she was coming down stairs to the main hall so I had to hurry and get in there. As I crossed the road in front of the airport, the light was about to change, so a policeman used his light wand to keep the traffic stopped until I made it across – nodding to me as I pasted him (giggles, that was a first). As I entered the main hall I saw her just starting to walk towards me so I veered off and stood on the side of the entrance into the main baggage hall as she came up. When she came up to that entrance she was totally surprised and sooo happy! She couldn’t believe how beautiful I looked (her words), and was amazed at the dress I was wearing. She said she had seen a woman off in the distance that sort of looked like me!! The confidence I felt from the makeover carried through the entire time. I was not nervous walking into a crowded airport, partly due to the rush trying to get there in time. However, I did notice some looks as this nicely dressed woman (me) reached over to grab two large and heavy suitcases and struggle to get them off the baggage belt! At least I stayed true to form and struggled (well, they were heavy)! After struggling to get the luggage into the car (it’s a bit different handling large heavy luggage wearing a long dress) I drove us over to our favorite Thai restaurant and my partner opened to door for me! The waitress (who knows us from the many times we have eaten there) looks at me and smiles broadly. We had our favorite appetizer – shrimp in peanut sauce along with a couple of deliciously cold Sing Tao beers. Lisa had a curry and I had a delicious pork crispy noodle dish. We had a lot of people smile at us. When we got home, I noticed I had forgotten to bring up the garbage – ack! All the careful prep for today and I missed this one item. So in my beautiful dress I hiked the garbage up. Now before, I would hide just behind the hedge row up there if a car or if someone came by. Not anymore! I now have the confidence and pride to be who I am and I just walked out there! It’s now four days later – this experience has carried over and continues. I have now talked to 98% of the people at work, I’m 100% presenting as a woman everywhere, using the woman’s restrooms and have now started my RLE (real life experience) four months earlier than I had planned. As one of the woman friends at work pointed out – I’ve ‘grown’ beyond what I can hide anyways – might as well come out fully as a woman and “feel it, own it, be it”! 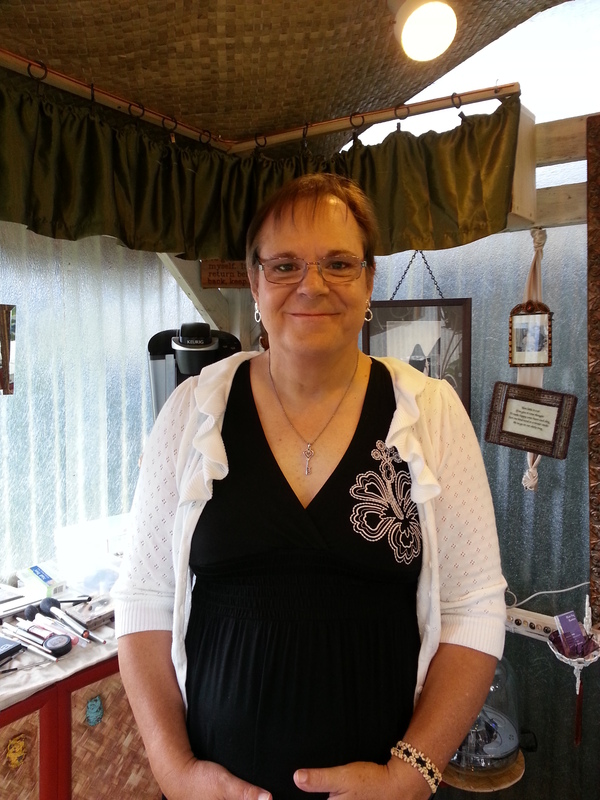 Posted in Diary and tagged First time dress in public, Transgender, Transition, Transsexual. Bookmark the permalink. We are so very happy for you. In your eyes we see contentment and it is beautiful. Mary and Julia. Mahalo Mary and Julia – yes contentment and an internal peace that is hard to explain. Congratulations, Sifan. I”m excited for you at this new beginning. By the way, I grab the luggage from the carousel, too.